I love that you are real and you aren't hiding behind this "perfect" little facade that some people have created in the blogosphere. Thanks so much for posting this. I'm glad you are who you are. I have learned so much from reading your blog. I've been through a tough time lately and I'm working through that. I don't have a life partner anymore and I have to do a lot of things on my own now. I too suffer with debilitating migraines, so everything sometimes takes twice as long to do. Thank you for sharing your ups and downs with us. I for one, appreciate your authenticity. Reading your blog has always been a ray of sunshine for me. Being honest and true to yourself takes courage, girl, and you should be proud you have that in you. I think you are wonderful. Reading your blog and seeing the honesty and truth in your posts is so refreshing. Life is too short to be anything other than what you are. I prefer to read things that are authentic and real. Some blogs, while beautiful and creatively inspiring, don't seem like they are written by flesh and blood people because everything in their home always looks perfect and/or their projects always work. Of course, I know that isn't true, but it's sometimes helpful to read about challenges others face. One can never go wrong by being authentic. Honestly I like that you are so open. It helps us remember that we are all human, even those bloggers whose blogs are always sunshine and roses. I love reading your blog, and though I've never met you in person (I would love to) I know you are honest, caring and authentic. What more can a person ask for? Thank you so much for posting this! The journey toward authenticity is life-long yet vital to one's well-being. Thank you for articulating this so beautifully! Lori, you have said what many of us feel and want to say. I feel I have so many new friends now and I feel that I am actually getting to know them for who they really are. I love that you are going to be you and I am going to put everything you have said into practice in my own life. Here is to being real and honest. You rock Lori, when you're sad, I'm sad and when you're happy I am happy. Lori, this is exactly why I read your blog. Keep doing what you do. Good post Lori! Like the delinquents I used to work with would always say, "Keep it real!" You go girl! You are not awkward in public... you are fun to be with! You are a perfect "you" and need to stay that way! This was a great post today. I thoroughly enjoyed reading it. You be whatever you want to be. I, like many others, have been inspired and made positive changes in my life thanks to something you've sent out into the world for us. ((HUGS)) Lori, and I am so glad you are authentically you :) You are so real, reading your blog is like being a real part of your life and I am grateful for it, and for your willingness to share yourself Thank you, so much, for being YOU. Hey Lori, I've had this banner on my sidebar since the beginning as well, so you know how much I appreciate all that you've shared here. Just keep doing your thing, it's all good! Just wanted you to know that I really like this post and this idea. i love that you are authentic. it means so much to me to read your blog and feel like i'm not the only one out here who feels that way. and i admire you greatly for your honesty, your out-there-ness. being true to oneself is a beautiful thing, and you are, without a doubt, a real beauty. shine bright, sister. you encourage me to do the same. I'm cheering for you, Lori! 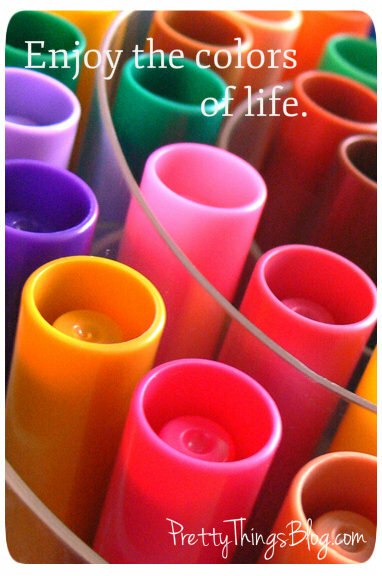 I adore your blog and the 'realness' of it. The people who don't like it unfortunately probably don't have the courage to be authentic themselves and feel threatened when others do. Don't let them get you down. Love and light to you Lori! 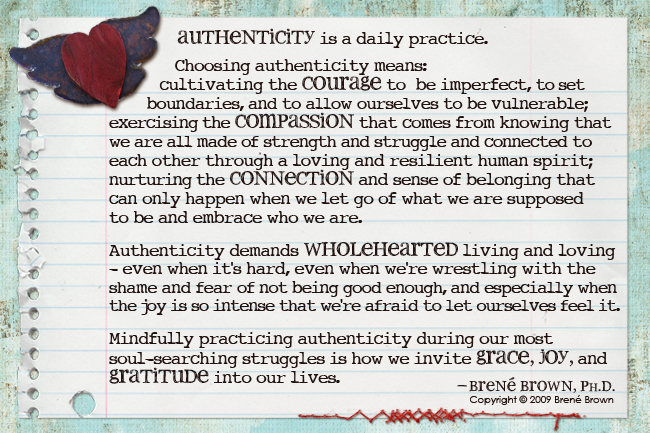 Brene Brown is one of my favorite people...and yes, authenticity is just so much less exhausting then trying to be someone else, isn't it? You express yourself through words, that's the authentic you. Rock On Lori! Thanks for being you, Lori! I somehow needed to see this today - rough times. I know what second guessing and people pleasing is like, but please know you are an inspiration! I find your art inspiring. Last night, I pushed myself to finish a necklace (with vintage beads!!) for a small contest. I have to admit I was inspired by the beautiful asymmetry of your style. Beautiful post!! You go girl! Beautiful, beautiful post Lori. You have beautifuly expresses so many feelings I have and have had in the past. Thank you for putting it in words. I was so tired last night that I saved this post for this morning when I would be able to read it clearly. I'm so happy that I did not skim over this in a fog of exhaustion. Your thoughts on authenticity are beautiful and I thank you so much for putting them out there for the world to see. It is hard to be 'real' even in the day to day in person exchanges. It can be even harder to be authentic (real) in this intimately connected yet disconnected world of blogs, facebook, etc. I think most of us are conditioned to put on that good face, soldier up, and carry on and I think that is especially true when it comes to social media. The anonymity with which people can make comments on our thoughts can certainly make it even more difficult to say what we truly feel, what is in our hearts. Life is indeed hard at times and I think it is soul destroying not to acknowledge that because it denies growth in our emotional and spiritual life. It denies reaching for our potential, for our happiness. One of the things I appreciate most about you, Lori, one of the things I feel such gratitude for is your honesty, your authenticity. You share the ups, the downs, the in betweens. That is the real life that all of us live. I think by sharing your life with us you give us permission to be honest with ourselves and that my friend is a great gift. Thank you. I started reading your blog because I loved your jewelry. I've stayed reading your blog because of your authenticity, openness, and honesty. So keep at it chica!! You spoke to my heart Lori, and it's because you speak from your heart that it touches so many. I like your authentic self and applaud you for being brave enough to share it with the world! Hugs (or as I learned the new word just now from Skye, glomp!) I know we've discussed this before, but I enjoy the honesty of your blog, and it has encouraged me to be more open in mine as well, including sharing the downs as well as the highs. It's simply more real that way. So thank you! I love it! Well said and well done! I love authentic! I hate pretentious! You go girl! I'll choose Authentic over Fake every time. Stay strong. 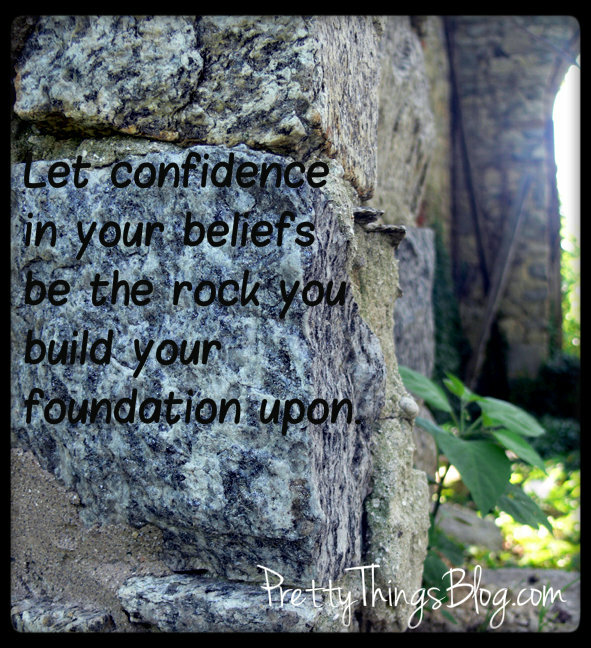 I enjoy reading your blog--continue "keeping it real." what a great post...you have spoken from all of our hearts! And I also loved your article on the May issue of Beads Trend, I just started with jewellery making and it inspired me!! Love it! Thanks for writing this post. Oh Lori, I love your blog,warts and all, that is why I read you everyday. I love keeping up with you and Zack and what you are doing. I do so much admire you. I use to journal everyday, it is better than a phyc. I would get my husband and children off each morning then I would take my coffee to my place of comfort and meditate and write. Mine were letters to GOD then I would listen to what HE said to me, in my heart. I got thru some really tough times. Oh Lori, I love your blog warts and all. That is why I read you everyday. I use to journal everyday. I would get my husband and children off each morning then I would take my coffee to my place of comfort and there I would meditate and write. Mine were letters to GOD. then i would listen to what He would impress on my heart. It was better than a Phyc. I got thru some really tough times. I love hearing about you and keeping up with you and Zack. I could have stopped reading here: I like what I write, I like who I am, and I want to be real without fear of what people might think. I'm one of those people who admires you for being honest. Often, I want to write in the same candid way that you do, but I still don't have the courage. Watching you do it makes things easier for me, bit by bit. This is YOUR blog and you can write what you want to. Those that think that you are full of "crapola" can go read Miss Merry Sunshine's blog. No one is forcing them to read your blog. The rest of us, who appreciate real people, will keep on reading. Part of having an opinion and vocalizing it is knowing that it's probably not going to sit well with everyone. Choosing to do so anyway is pretty much my definition of courage. Rock on, Lori, and don't let the bastards get you down. Also? 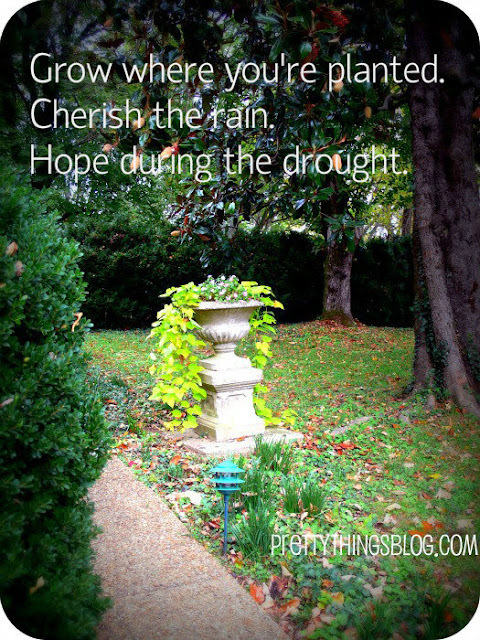 Showing the authentic, true side of life is enormously refreshing. I am the same way. I am very real on my blog. I hate it when I check my stats after a "real" blog post to find that I have lost one or two subscribers or I get the meanie comments. Like you, I am crushed... for a little while. But it always makes me back into my shell a little bit and I have gaps in posting because I want everyone to "like" me and I have such thin skin when they don't. But if I don't share who I really am, I feel that I am not being honest and it does hurt to hold it in. I just need to get things off my shoulders and I know that in my subscribers is someone who understands. HUGS! Thanks for sharing. I hope you continue! I am so glad you are back!!! I thing you are as authentic as they come!!! Never be afraid to be who you are!!! Always remember, you are always in my heart and in my prayers!!! Have a Blessed Weekend! Lori, this post made me so happy for you. Being authentic is so important, and I believe you always are. I once had a shrink tell my younger daughter that I live the truth of who I am better than most. I've lived on that comment as it showed that I'm doing what I want and being what I want. AND that it was recognized. I love that. I know we're online friends and don't really know each other offline but I have always thought that you were living the truth of who you are and it's one reason I love you!